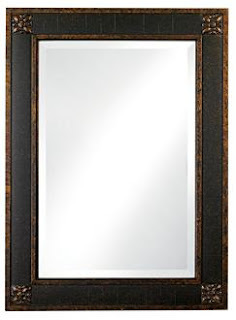 Mirror, mirror on the wall, who's the fairest of them all? Ever have one of those days when you beat up on yourself because you felt unattractive? Have you ever looked at the Hollywood's rendition of women and found yourself coming up way short of America's idea of beauty. 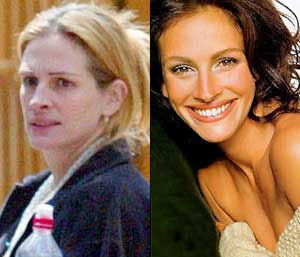 If only we could look like Cameron Diaz or Julia Roberts then everything would be alright. NOT! Get a load of some of our "icons of beauty" sans their makeup. Just goes to show you that they are no different than the rest of the women in the world. 1. Chalize Theron - Can you say Monster? 2. Christina Ricci - I have never seen her look like the picture on the right. 3. 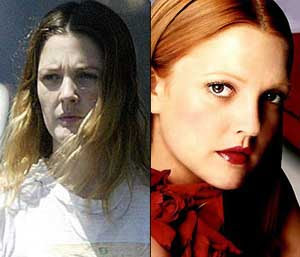 Drew Barrymore - At least the photo looks like her. 4. Calista Flockhart - Ally McBeal eat your heart out. 5. Cameron Diaz - How about opening up a bottle of proactive! 6. Halle Berry - Not bad, comparatively speaking. 7. Julia Roberts - Pretty (or average) Woman? 8. Lisa Kudrow - Whoa Lisa! Who let the dogs out? 9. Pamela Anderson - Is this who Kid Rock and Tommy Lee was fighting over? 10. 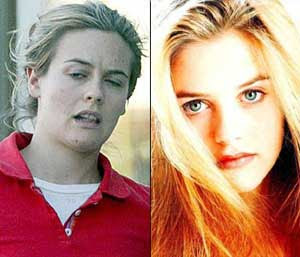 Alicia Silverstone - She looks like she just got out of jail. 11. Penelope Cruz - If she ran a comb through her hair, she would be alright. 12. 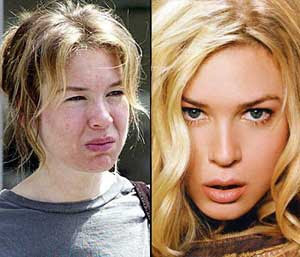 Renee Zellweger - She looks like she just took a bite out of a lemon. Bridget Jones look out. 13. I am not revealing the name of last, very famous celebrity. Guess Who She Is? Yikes!!! This T 13 should help women keep things in perspective regarding their own appearance. Since most of these w/o makeup photos are horrid, it'll be easier to say which ones don't look all that bad. My vote goes to Halle, Julia, and the celeb in the last pic (Jessica Simpson). I had to dig a little to find you - you may want to re-post on the TT-13 site- as the code from your name doesn't go to your blog. But, I found you! I always get a kick out of the magazines when they do this. Why? Because we'd ALL look like movie stars if we had stylists, make up artists and airbrushing! And yeah, I knew that was Jessica! You are so wrong for this (LOL). Tell me now, did Malcolm put you up to this?! I'd expect this sort of thing from him (tee-hee). Visit my T13 : What I want..... Thanks. I'm feeling much prettier now after this TT. Thanks!!!!! Amazing what a bit of paint can do. It is pretty scary, but only because we as a society have glamorized these women. They are no different than average, everyday women. Thanks for letting me know about the link. I don't understand what happened. If us regular women had the hair, photography and makeup, we too would be gorgeous. I glad you feel better and that was actually my point. Women should all be okay and comfortable in their own skin. I too wish young girls saw the stars as they really are and not what they are made up to be. You make an excellent point physical, superficial beauty fades with time. That's why it becomes important to have inner beauty. I know it sounds cliché, but as Marilyn Monroe put it "we all lose our charm in the end". It does seem like something Malcolm would do, but alas it was my idea. I actually wasn't trying to mean, but rather just trying to let regular ladies like myself know that what they using as a barometer for beauty is an illusion. Some needed the help a little more than others. The last celebrity is Jessica Simpson. That was the goal. To make women feel good about themselves. I really wasn't trying to be cruel or wicked. Just shedding a little realistic light. I think this might be favorite TT of all time! Thanks for the reminder of how much these women are airbrushed to superstardom! The last is Jessica Simpson, yes? Julia Roberts looks like a freak! And without makeup even more so! Makeup, lighting and a good photographer can work wonders obviously!!! I think those are exceptionally bad "bad" pics of Drew Barrymore and Halle Berry, though.. I normally think both of them are gorgeous with or without makeup. Actually, some of the celebrities look better to me in the before shot (Berry, for one). They look like women I would actually meet and see. When teaching meda studies courses, sometimes we get into the topic of how women are portrayed in visual media. Needless to say that the ideal has become such a daunting standard to live up to, that we often used pictures like this to show that the people don't really look like movie stars. Hell, the movie stars themselves don't look like movie stars either.